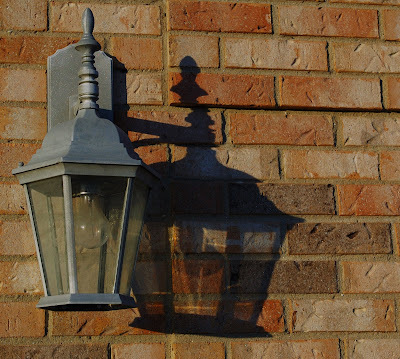 Keeping with the "Light" theme from yesterday's Photo of the Day, I snapped this picture of one of our outdoor lights. The cloud free sky today allowed ample sunlight, and I love the color of the light as the sun slowly descends in the afternoon. I was drawn to the color and the shadow along the brick facade. I only took one picture. Maybe if I restrict myself, it will force me to think before shooting. [although I admit, I didn't think very long before I took this photo - it was cold outside] What would I do differently? I would drag out the ladder or something to stand on so I would be on the same plane as the light. Because the perspective is tilted to me, which I don't quite like (I am one of those people who makes sure the horizon is straight in my pictures - it must be the engineer in me). Maybe I would try to get closer to force a shallower depth of field. Maybe next time (which is, tomorrow! ).